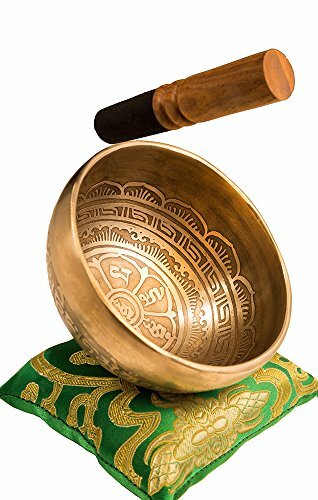 In this article, I will discuss some of the best Tibetan bowls that you can buy online. The historical instrument creates sustained musical notes and vibrations to soothe your senses. They are mainly used for alternative healing practices, spirituality, and meditation and today, people from all over the world are using it for emotional cleansing. Moreover, many musicians are now using the bowls in their scores. You can often hear the ambient sounds in the background. 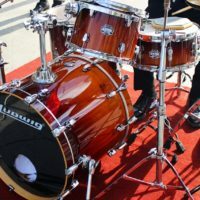 Of course, these are not electronic instruments, but they were close to top of the list in acoustic instruments that I wanted to write an article on. Created by Nepalese artisans, it is a singing bowl featuring wonderful tones at a very decent price. Create a long-lasting set of harmonious tones with Silent Mind. Perfect for Chakra healing, yoga, and deep meditation. Handmade in Nepal from seven different metals, this singing bowl represents the sun, moon, and planets. Crafted with pure metals, the bowl produces melodious and long-lasting sounds. Tibetan bowls are known by several names – singing bowl, standing bell and bowl gong to name a few. 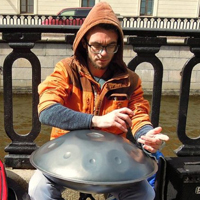 It is stated that they first originated in China in a form of a metal bell, however, ‘Tibetan singing bowls’ date back to a pre-Buddhist time where they were used in an ancient Tibetan Bonpo Shamanistic ritual. Tibetan bowls are capable of ‘singing’ through a phenomenon called friction idiophone. In this method, a mallet is rotated on the bowl’s rim to produce continuous vibrations and notes. How does it work? The resonant sounds of the bowl synchronize with Theta brainwaves and produce a harmonious balance in your mind that allows you to enter the relaxed state. The tones encourage creative thinking and instinctiveness. I have to admit that it is quite a solid singing bowl set considering its great price and tiny size. Its dimensions are only 3.5 inches which means it is small enough to conveniently fit in your palm. 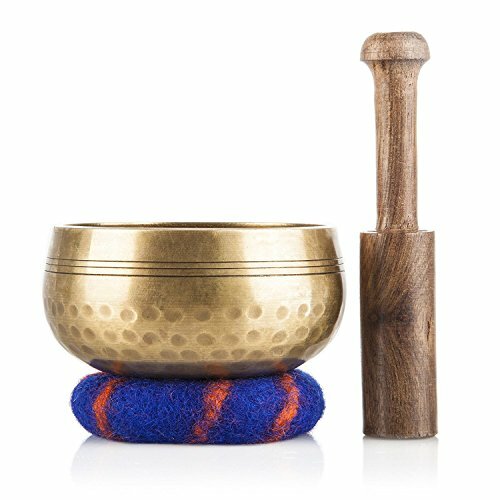 The hand-hammered set comes with a meditation bowl, a wooden striker and hand sewn cushion. The cushion steadily holds the bowl in its place. I usually use the Ohm Store Tibetan bowl during my early-morning yoga sessions to clear out my head. I find it gets rid of the brain fog quite fast. Its sounds are highly energetic and boosts the healing process. It will help you to fight stress issues, pain, depression, insomnia, and many other diseases. For me, it works perfectly. If you are planning to use as a decorative piece, keep in mind that its striker is made up of unpolished wood, so its appearance won’t be glossy. Otherwise, it is a handy bowl that will even make water ripple if you hit the right chord. Silent Mind singing bowl set is designed to easily fit in your hand without compromising on quality. Its dimensions are only 4.5 inches, but its resonance and vibrations are comparable to that of the bigger bowls. For a longest time, I wanted to try a bowl that produced long-lasting ‘deeper’ sounds. Silent Mind did the trick! It surprised me with pleasant results once I figured out how to play it for an extended period. The harmonious tones reduced my stress level in just five minutes. Every time I use it, I notice a stark difference in my mood and energy levels. On the other hand, if you are used to larger singing bowls, you might struggle to get the bowl sing. I can give you a tip as it worked for me. Strike the bowl hard and slide the uncoated hardwood part of the mallet on the outside rim to make it sing. Moreover, I loved its antique design and its etched surface. 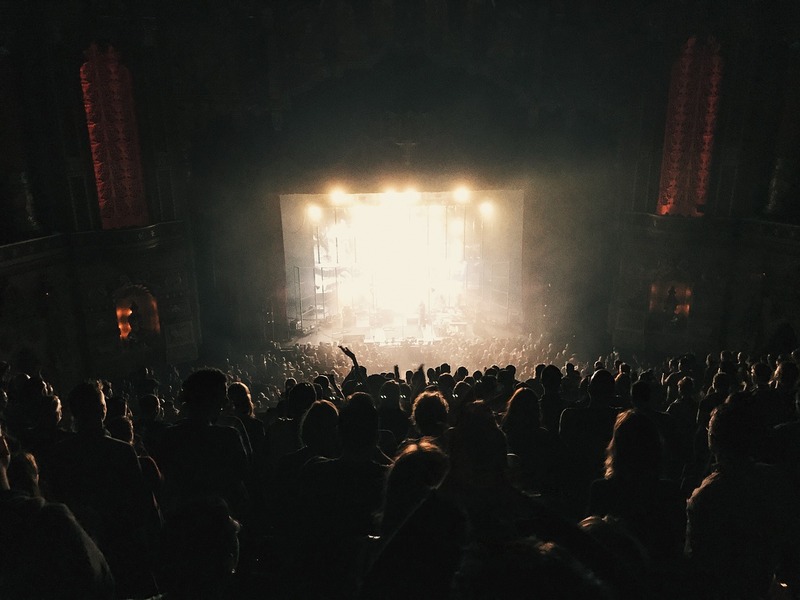 Sadly, the high surface tends to alter the song by producing a rough and rasping sound. Nonetheless, it is a good buy for the price you pay. 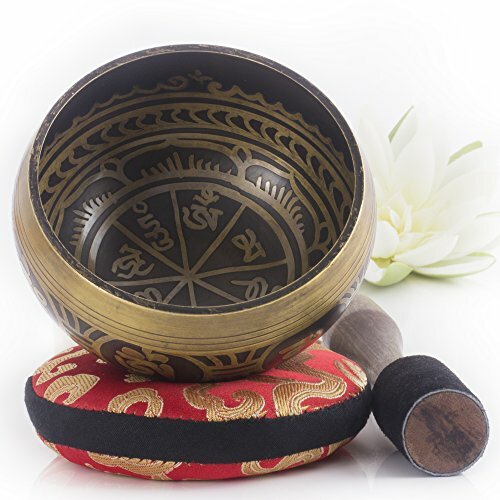 This Tibetan Singing Bowl Set has a bronze mantra design that comes with a leather striker with a pencil grip and a hand-sewn pillow. One thing I truly liked was that the wooden striker is felted from one end to prevent scratches against the bowl. It is quite sturdy with a great grip. The cushion is well-crafted and sits nicely in the palm. When you play the bowl, make sure your hand is flat. Don’t close the fingers around the bowl as it will mute or distorts the sounds. 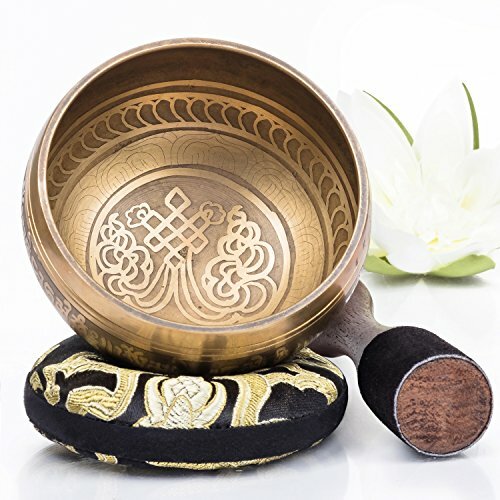 Whether you are a beginner or a massage therapist, the Silent Mind singing bowl set will live up to your expectations. The company offers a 30-day money back guarantee, in case you are not happy with your purchase. The hand-hammered singing bowl is composed of seven different metals that are gold, silver, copper, iron, tin, lead, and zinc. Each metal plays an important role in the song and represents our galaxy. The bowl’s diameter is 6 inches and height 3 inches. 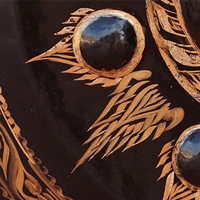 As the bowl is handmade, there are several dents on its exterior and interior surface. As first, I thought the marks would interfere with the sounds. I expected the song to be tinny and raspy. To my surprise, the sounds were clear and smooth. This bowl is associated with B-Chakra, also known as crown chakra, positioned at the top of the head. Its imbalance results in mental disorders such as psychosis, exhaustion, nervous breakdown, psychic debilitation, hyperactivity, weakness, and migraines. When crown chakra is harmonized, it produces bliss and peace by influencing the pineal gland. The particular singing bowl helps to keep your emotions at bay, and positively affects your mental health. 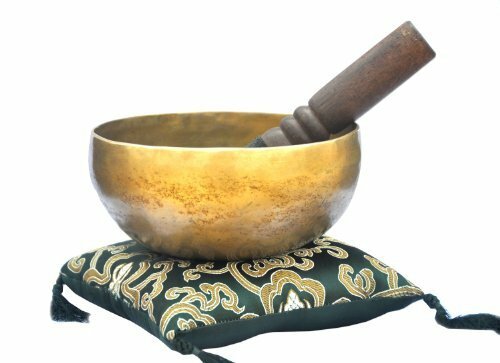 Superb B Crown Chakra Old Tibetan Singing Bowl comes with a handcrafted mallet and a green cushion of silk. It is a great purchase if you are looking for mental peace and wish to keep your B-chakra balanced. The first thing that impressed about Yak Therapy Tibetan bowl was its beautiful packaging. Glossy and neat with intricate design, it would make a perfect gift. The bowl is small and lightweight. It easily sits in your hand, but you would need to balance it properly to prevent it from falling off. It took a little patience to make the bowl sing, but once it did, I was rather taken by its ambient sounds. For starters, this bowl is perfect and falls in budget without a doubt. If you struggle making it sing, you can check out tutorials on YouTube. The complete set includes handcrafted bowl, a real silk cushion, a hardwood mallet with a leather felt on one end, a silk drawstring protective bag, and an attractive, handmade gift box composed of Lokta paper. Brings the most out of your Yoga and massage sessions. In order to make a singing bowl work, you need to emanate positive vibes. Don’t try to make it sing half-heartedly or with negative energy. It only works if you want it to work! Before you get frustrated, take a deep breath, smile, and begin the song.